This week's PopMatters post is historically oriented: it's a review of David Kushner's book Masters of Doom. The book's subtitle "How Two Guys Created an Empire and Transformed Pop Culture" is representative of its focus. 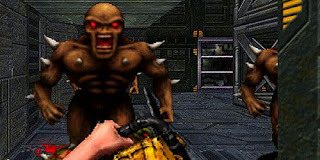 Kushner uses the stories of John Romero and John Carmack to trace not only the rise of id Software, but the trajectory of the medium. This works because those two guys were largely responsible for some of the most important developments in gaming. Without Carmack, who knows how long it would have taken to figure out smooth scrolling on the PC? The entire PC graphics card industry was pushed forward by his drive for increasingly complex technical feats. His consistent programming advances defined the way 3D and first-person environments were conceived and created. Romero (a talented programmer in his own right) was an early ambassador for what we might call "gamer culture." Not only did his design and artistic insights inspire a generation of players and designers, his persona transcended his games. For better or worse, Romero came to personify the brash, raucous style of gaming that came to define the first-person shooter genre. While his enthusiasm often got him into trouble (Daikatana), his passion for the medium compelled him to unashamedly extol its virtues. The book was written back in 2003, which makes it interesting to see where Carmack and Romero have gone since then. Their strong personalities sent them on separate paths that seem consistent with their different philosophies. Carmack is still pursuing technical excellence, perhaps at the cost innovative design (Rage) and Romero has continued his search for the medium's frontier (his most recent work has been on Facebook games). I can't help but think about how well their skills complement each other. In many ways, the two Johns go together like Lennon and McCartney, but we all know how that ended up. Masters of Doom is also a valuable book in a historiographic sense. Video game history, especially the cultural side of it, is still a relatively new field. Kushner's work recounts historical events in an engaging manner, but it also demonstrates a strategy as to how to produce such a project. The book relies heavily on interviews and personal archives rather than technical data and periodicals. It's difficult to tease out the stories when conducting oral histories, but Kushner backs up his exhaustive reporting with a variety of sources to form a credible, entertaining story. Video games have only been around for fifty years or so, but it's certainly not too soon to start writing the medium's history. The video game world moves fast and, as Masters of Doom shows, there's value in documenting the past while the people who helped make it are still with us.